We all heard of “AllShare”, a system created by Samsung to allow wireless sharing of content across devices, from TV to smartphones to tablets and even cameras. Ever since the first Samsung Galaxy S, Samsung has made it possible to transmit your phone display onto a big screen via MHL (Mobile High-Definition Link) cable, which is essentially a micro-USB-to-HDMI connector. This method, however, wires up the phone to the TV, restricting the interaction, especially when playing games. The Samsung AllShare Cast Hub is a new product to let you break away from wires and beam your phone display wirelessly to the TV screen using Direct Wi-Fi. It allows users to wirelessly connect their compatible Galaxy smartphones to their television to transfer smartphone content onto a larger display immediately. It lets users play together – beam photos, videos and even the game they’re playing onto the big screen while the smartphone doubles as a controller. The package consists of the dongle, HDMI cable, and AC adapter. Once you plug everything up and turn on the TV to display the HDMI input, you will see on-screen instructions to pair the dongle to your Galaxy device. I only manage to pair my Samsung Galaxy S3 after several attempts. 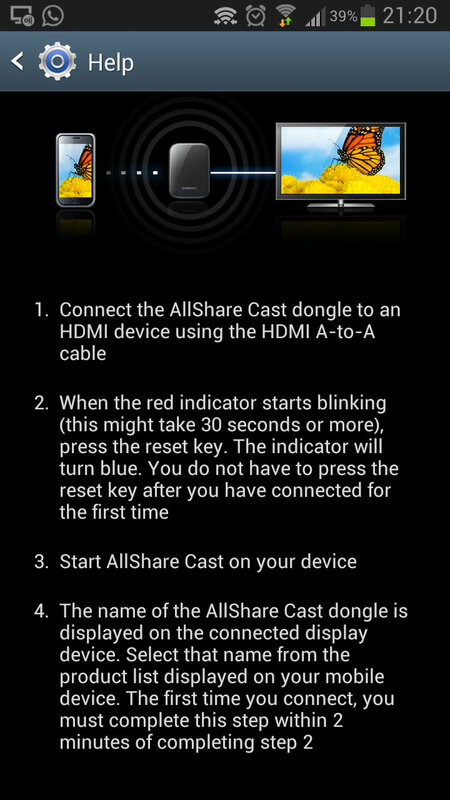 When I activated the AllShare Cast on my phone, it detects the dongle but pairing failed. I wasn’t sure if it’s because the dongle was not a retail unit, but if you encounter pairing problems, just try again. Help is available on-screen and on the phone. Assuming you pair your device successfully, your device screen display will appear on TV. Everything that appears on your phone will be mirrored on the TV, including audio. That’s all the dongle does, nothing fanciful. There is a slight lag, and video output is generally smooth when the connectivity is optimal, with the exception of occasional jitters. The AllShare Cast dongle does everything that a MHL cable does, so why get it? Because you are free from wires. You can use your device wirelessly away from the TV. The drawback is that you might experience occasional connection problems, the video output is not full HD and audio is limited to stereo. The price is also higher than the MHL cable, but you pay for the cool factor. The AllShare Cast is currently compatible only with the Galaxy S3, Galaxy Note 2 and Galaxy Note 10.1. 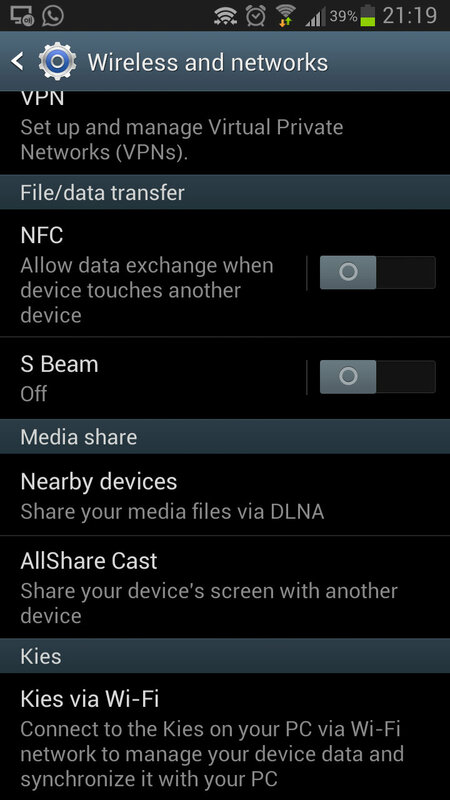 It will be available on any future devices with the “AllShare Cast” option under the phone settings. Currently retailing in Singapore for S$169.